Lets turn the last post on its head, spaghetti – decided to go with an ingredient I hadn’t yet tried, spaghetti squash. It is my mission to go outside my comfort zone when making these crocks. Need to lose a tad bit of this gut that I’ve acquired from copious amounts of fermented hops via excellent Northwest beers. Enter the somewhat paleo diet. For the most part, just trying to eat whole foods with limited packaged foods. Enough with the preachy, more with the crocky. Mix onions, garlic, leek, celery, egg whites, herbs & turkey meat together – form into 1 1/2 inch meatballs. Cut squash in half – use a big knife, cutting is kind of difficult. Put a small layer of tomato sauce in crock bottom (just enough to cover bottom), put squash cut side down. Layer the meatballs as best you can & then pour remaining tomato sauce over meatballs. Set on LOW for 5/6 hrs. Pull the squash out w/ fork or other implement – scoop out the innards of squash & separate to plates. 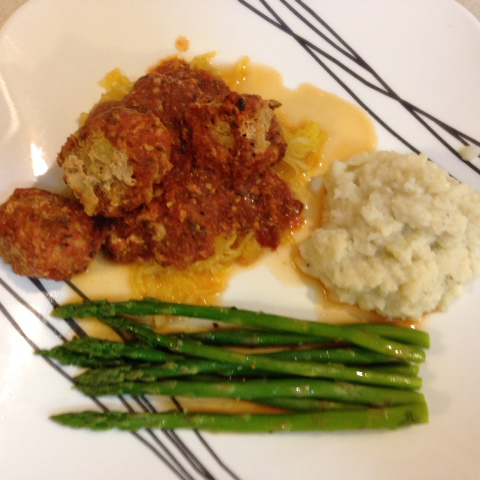 Put a few of the meatballs on top of spaghetti squash & then pour some of the sauce over all of that. Dang, that dish was amazing. Had no idea that spaghetti squash was so good & my homemade hot sauce would push it forward. Low fat, meaty & just enough hot (its a steady hot). Put in food processor – processor it up to a viscous paste. 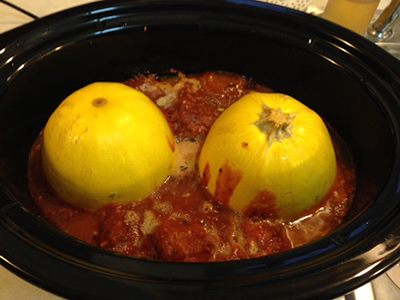 Last tip: I would make a whole crock of the meatballs & minus the squash – they are amazing.